If you're anything like me, after a cold, dark winter you have started to crave an injection of colour. Being a monochrome addict I'm not talking anything to big or bold. Just a little pick me up. British beauty brand Barry M may ring bells of glitter and hair mascara, but as you grew up so did they. Last year they literally nailed it with their great selection of polishes to keep your fingers bang on trend. Their Gelly High Shine nail varnishes were one of my favourites available excelling in both staying power and price. The products make ideal lunch time treats being available on most High Streets and with prices starting at just a few pounds. The packaging is clean with a fun pop edge you mind find on a Tokyo brand. My newest additions are bright and pretty and create a lovely spring, pastel look. Firstly blusher. I've never been a fan. Until recently. Now I am addicted. A little delicate splodge on the apples of your cheeks with very little else feels rather Scandinavian. This chubby sheer crayon is perfect for popping in a handbag and adding a little colour on the go. Dry lips are a January hate that can be easily fixed thanks to these amazing tinted lip balms. They are stuffed with vitamin E, shea butter and jojoba oil and give SPF 15 coverage. The sheer pretty colours are a perfect pick me up and all for under £4. 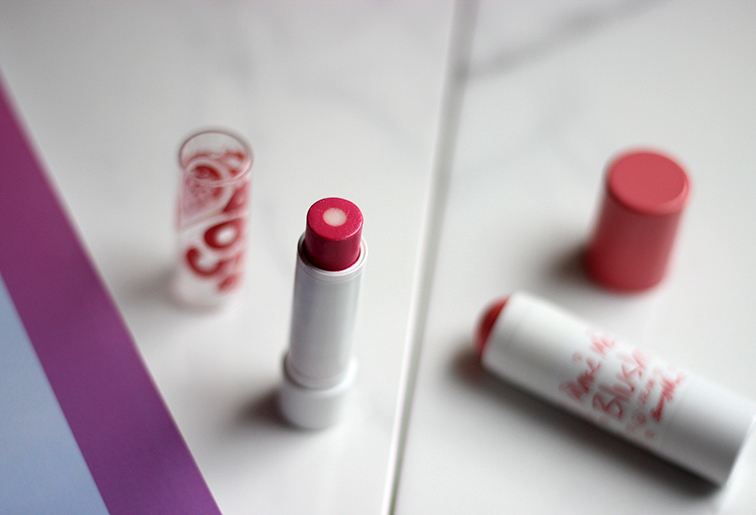 This Rosie Lea is a bright but sheer, candy pastel pink (not fuchsia like the packaging) and gives good coverage. Give them a go and let me know your thoughts!